For thousands of years roses grew wild and carefree. The only practices used or known were organic. Then rose breeders started exploring the possibilities and many roses were created that are disease prone, hard to grow and discouraging to gardeners. Chemical manufacturers came to the rescue and now Roses are one of the most chemically treated class of plants in the landscape. So do Organic gardeners have to forgo this lovely sculptured flower? Not at all. As Barbara Wilde explains the proper selection of old roses combined with some exciting new disease resistant roses gives gardeners more than a fighting chance for growing beautiful, fragrant roses. Starting with a bit of history we see how the rose got into the mess it is in today and what is being done about it. Giving us the names of today's rose breeders that are concerned about our success with roses is a special bit of information we can carry with us when we choose the right rose for us. Understanding the different classes of roses, which is presented here in a clear concise way, will also help us to choose what is right for our gardens. As organic gardeners know success in the garden comes with the proper care of the soil, the right selection of site and the best choice of plants. Ms. Wilde teaches us all of this and much more. From fertilizing to pruning and more, her instructions are easy to understand and very thorough. She addresses disease and insect problems and even suggests how to plant a beneficial insect garden to help defend your roses against dastardly bugs. The best part of the book, though, is her chapter on remarkable roses. This encyclopedic like chapter is divided into sections of use. From small shrub roses to recommended ramblers, we are given over 100 choices for the best roses to grow easily and organically. Each rose is given vital statistics including class, hardiness, size, pruning instructions and more. The photographs will have you drooling as you choose which rose to plant first. I was glad to see that Ms. Wilde shares my feeling that roses don't need to be isolated in a garden by themselves. In her last chapter, she shares her garden designs for roses in mixed borders, wild gardens, wildlife gardens and hedges. 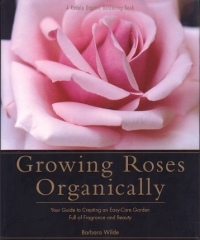 Growing Roses Organically is an important book for anyone just getting interested in roses, struggling with roses now, or looking to change from using harsh chemicals to natural methods.